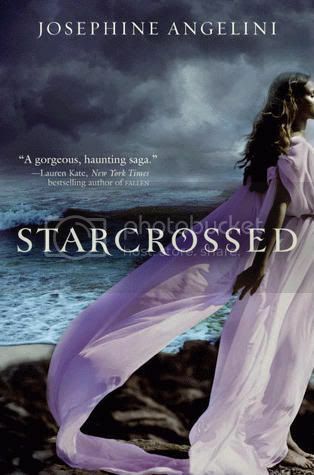 Starcrossed is a wonderful mixture of Greek mythology, and a forbidden love. The book started off a little slow, but soon I became so fascinated that I flew through the pages. It made for a read that I really enjoyed! All of the characters, including the secondary ones, were well written. I really liked and related to the main character, Helen. She was shy and almost introverted. (So am I.) But she was like this for a reason, to keep people from noticing how different she was. We do see her grow more confident in herself throughout the book, especially after she meets Lucas. Ah Luke… I love Luke! Their relationship was really interesting, especially in the beginning. I wasn’t sure where the author was going to go with it, but I love where it went. I really liked Luke’s family as well. His sister and cousins really made the book interesting. Especially Hector, I liked him. Helen’s best friend, Claire, was one of my most favorite characters in the book. She was a feisty little thing! I really grew to care for all of these characters. The plot was very creative and I found the mythology to quite interesting. I’ve read quite a few books lately that have dealt with mythology, and I definitely think this is one of the better ones. The ending of the book left me hanging a bit, in a way that I just really want to read the next book in the series. Like, now, please! Overall, this was a book that I really enjoyable read for me. It will definitely be a welcome addition to my bookshelf, and I’m anxiously looking forward to reading the rest of the series. I am sending a huge thank you to HarperTeen and Netgalley for allowing me to read and review this book. I really enjoyed it! I really love this new mythology trend. This one sounds great! I'll have to add it to my wish list! I enjoyed this a lot as well. I loved Claire and hope to see more of her in the next books. Hector was pretty awesome as well. I agree with you, the secondary characters are very well developed. Great review! I've been hearing some good buzz about this one! The book is getting a lot of praise. I take this as a good sign :P And okay, when the secondary characters are well written that is deff a double win for me yay! This sounds quite promising. I requested it from Netgalley, but was declined. I guess I'll have to wait until it shows up at the library. Thanks for the review! I've been interested, but not overly so. This definetely sounds like a book I'm going to be reading this summer! Have I told you how much I love your blog? It's soo cute. But I want to read STARCROSSED so badly. Great review! Don't be a stranger; stop by my blog and say hi! Good review, I'm having the opposite experience to you with this book but it's always nice to see what other people think. This book has been on my TBR list for a while and I have heard so many fantastic things about it! I cannot wait to read it! I love Greek mythology and just read one I didn't really love so hopefully STARCROSSED will bring everything back up for me. It makes me happy to see a review mention supporting characters, especially if they're fleshed out and interesting. Wow, this sounds like a really interesting read. I love Greek mythology so I'll definitely check this one out. Thanks for the great review and happy reading! Sounds great! I've heard lots of good things. I like introverted characters - I'm one too. And the mythology sounds interesting.